The International Olympic Committee is beginning a disciplinary inquiry into US swimmer Ryan Lochte following his allegations that he had been robbed at gunpoint at a gas station in Rio de Janeiro. IOC spokesman Mark Adams told The Associated Press the panel was formed on Friday to look into the behavior of those involved. Lochte, 32, had alleged that he and three other swimmers had been robbed by people pretending to be police officers. On Thursday, Brazilian Chief of Civil Police Fernando Veloso stated that Lochte's story had been proven false. He explained that the swimmers had been detained by a security guard after drunkenly vandalizing a bathroom at a gas station. Lochte claimed that he did not lie and that three minutes were missing from the released surveillance footage. He claims the missing minutes would show the moment he and the others were removed from the cab at gunpoint. In a statement posted on Twitter on Friday however, the twelve-time Olympic medalist apologized for his behavior. "I want to apologize for my behavior last weekend – for not being more careful and candid in how I described the events of that early morning… It is traumatic to be out with your friends in a foreign country – with a language barrier – and have a stranger point a gun at you and demand money to let you leave," Lochte said in a statement on Twitter, stressing he should have been more responsible," Lochte wrote. Following the initial incident, a judge had issued an order to seize the passports of the swimmers, but Lochte had already returned to the US. 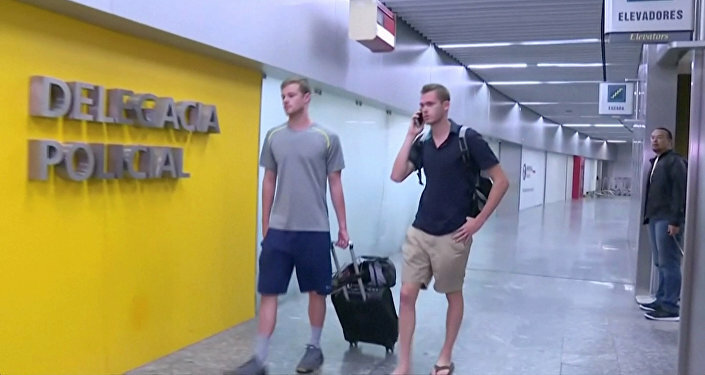 Two other swimmers, Jack Conger and Gunnar Bentz, were pulled from their flight on Wednesday and interrogated — and eventually confessed that the story had been fabricated. The US Olympic Committee has apologized for the actions of the swimmers. "The behavior of these athletes is not acceptable, nor does it represent the values of Team USA or the conduct of the vast majority of its members. We will further review the matter, and any potential consequences for the athletes, when we return to the United States. On behalf of the United States Olympic Committee, we apologize to our hosts in Rio and the people of Brazil for this distracting ordeal in the midst of what should rightly be a celebration of excellence," USOC said in a statement on Thursday.